-- Interpreted orally for immigration cases. -- Mandarin Interpreter for attorneys (barristers and solicitors), a former ambassador of a country to China, and others. Laserdynamics Inc. vs. Asus Computer International, Quanta Storage America Inc., Quanta Computer USA Inc., Asustek Computer, Inc., Quanta Storage, Inc., and Quanta Computer, Inc. – A patent dispute case involving computer storage source code. July 2016 Provided simultaneous interpretation services for a two day employee conference with a marketing focus for 200 - 300 attendees at the Nike headquarters, in Beaverton, Oregon. July 2016 Provided simultaneous interpretation services for China Media Capital and Sunshine Entertainment for their visits to Disney, Fox, Warner Brothers, Lionsgate, as well as meetings with Ron Howard and other directors. -- Co-Founded the Chinese translation company providing Chinese, Japanese, and Spanish translation and interpretation and voice over services in Los Angeles, New York, Chicago, and other major cities in the US and around the world. -- Translated press releases for the signing ceremony during the visit of Mr. Xi Jinping, then Vice-President of China. 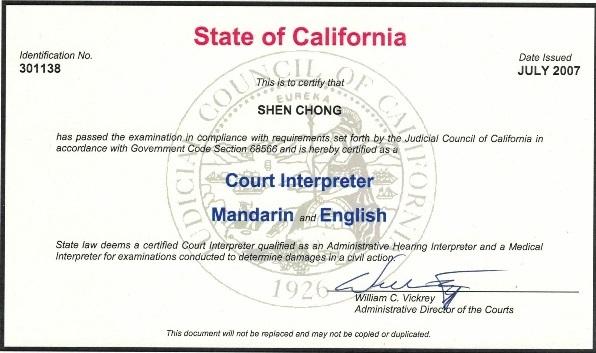 -- Translation and interpretation classes in preparation for the California court interpreter certification exam. -- Taught interpretation classes including consecutive interpretation, simultaneous interpretation, sight translation in preparation for California Court Certified Interpreters Exam. -- Translated and interpreted from Mandarin to English and from English to Mandarin for different industries such as legal, entertainment, business, sports, etc. -- Initiated, managed and expanded Los Angeles Chinese Learning Center, a non-profit organization aimed at promoting cultural exchanges between the United States and China through Chinese language classes and other services. 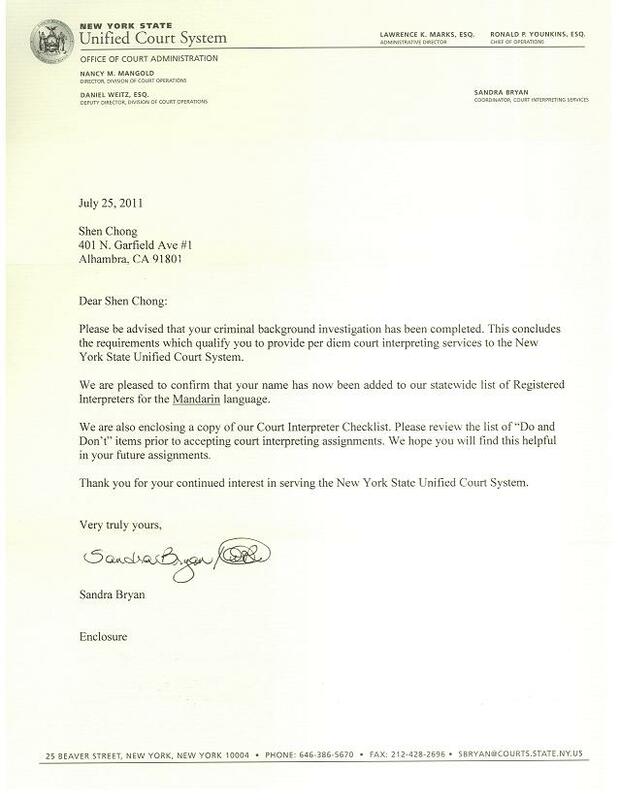 -- Provided consultation services to legal and entertainment firms regarding issues related to Chinese culture. -- Drafted legal documents such as briefs, pleadings, initial and amended articles of incorporation, stock certificates, buy-sell agreements, contracts, summons, and complaints. -- Assessed the strategic, operational, and financial risk of clients in various industries including petrochemical, manufacturing, retail, high technology, public infrastructure, and financial institutions. -- Reviewed contracts of commercial and syndication loan projects through consulting with legal councils, bank's management level, and client. -- Interpreted for one of the largest private entertainment companies in China (a publicly listed company) for the visit of their delegation led by its president to companies such as Trailer Park, Keshet, the Chernin Group, BCG Digital Ventures, MGM, WME, 8i, Daqri, Zeroth, Hitcents, Reload Studios, UTA, USC Institute of Creative Technologies, Sony USA, etc. -- Interpreted for team members of Fox International Channels from Taiwan. Topics include TV show production, TV ratings, reality shows, etc. -- Provided consecutive interpretation for Leslie Moonves and his senior executive team during a meeting with CBS Interactive China. Topics: Confidential. -- Provided consecutive interpretation services for journalists from China regarding Sony's 4K technology, as well as a business meeting with a well-known company from China. -- Provided Chinese language coaching services for the pilot of Exit Strategy for actor Tom Sizemore with director Antoine Fuqua. -- Provided Chinese/Mandarin simultaneous interpretation for US-China Co-Production Round Table Discussion held at Disney Inc.
-- Provided Chinese/Mandarin simultaneous interpretation for the first US-China Film Summit held in Beverly Hills, CA. -- Translated and consulted for the contents of Kung Fu Panda's DVD post production relating to Chinese zodiacs. - Translation verification and translation from English to Ancient Chinese for the scripts. -- Provided translation and interpretation services during the consultation process. -- Played a co-star role in one of the episodes of the TNT show "The Closer". --Provided Chinese cultural consultations to one of the screenwriters, Mandarin language coaching to its actors and actresses, as well as casting assistance. -- Interpreted for Mr. Chow, Yun-Fat for a Mandarin interview. -- Trained an actor for a Mandarin sentence in "The Big Day" show. -- Interpreted and trained casts of a Fidelity advertisement for a TV promotion targeting Chinese consumers. -- Provided translation services to course materials from English to Chinese. -- Expanded the magazine's partnership into the United States and Europe through cooperating with Project Syndication. Readership increased by 35%. Thesis: "The Japanese Banking Crisis and Its Policy Responses"
Certificate: "Doing Business With Latin America"